Of course, one of the biggest essentials is a good batting tee. Click here to see our top 5 recommended best batting tees. What is a bat sensor? Baseball swing sensors are one of the newest ways technology is being used to improve your swing. 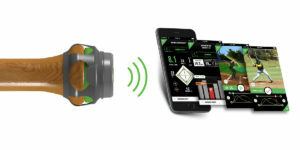 They are easy to use, just strap the sensor to the nob of your bat and connect to your phone via bluetooth. How will this help my swing? 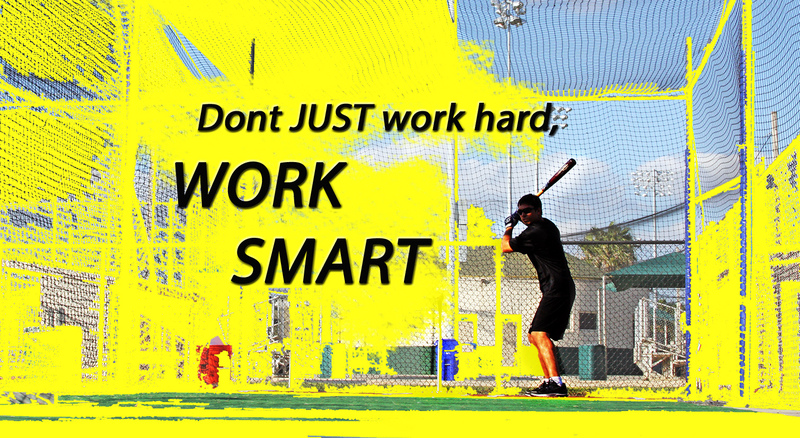 It will take the guess work out of improving your baseball swing and allow you to have clear and objective feedback. It tracks your progress over time so you can see if your latest adjustments are working for you or against you. You can find this product on their website, DiamondKinetic.com $149.99. Use our discount code PBI10 to get free shipping and $10 off. What is a one handed bat? Sometimes called a short bat, the one-hand bat is type of training bat that you can use during one-handed batting drills. Isolating your top or bottom hand uncovers weaknesses that you may not recognize when using two hands, which is why they make my list for best hitting aids. What to look for when buying a short bat for batting drills. Look for a bat between 24 and 28 inches long. The company you use for your short bat is not as important as the one you choose for your game bat. Because you don’t swing as hard with one hand and the amount of swings you will take with this bat is less than your normal bat. For these reasons, the quality of wood shouldn’t be a huge deal. If the wood does start to flake you can always wrap athletic tape around the barrel of the bat. 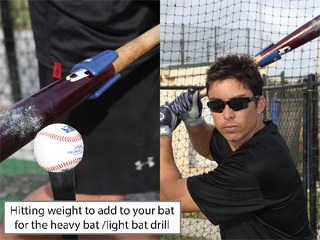 Baseball Hitting Drills for a Batting Tee – Did you get yours yet?. Major league hitting drills accompanied by full color illustrations and a FREE VIDEO for each drill. Players – These are 20 drills you can use to groove your swing during your own time. No partner needed for these drills! Coaches – These drills are all done with a hitting tee, so they’re perfect to teach during practice so that players can continue the practice at home on their own. Click here to learn more. What is a fungo bat? The main thing about a fungo bat is that it weighs typically about 10 ounces less than a regular baseball bat of the same length. 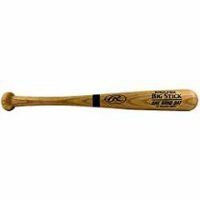 The barrel will be thinner, and it’s no problem to use a fungo bat that is few inches longer than your regular bat. For batting drills, the length doesn’t really matter that much. What is a fungo bat used for? Using a fungo bat will take the strength you gain from swinging a heavy bat or lifting weights and turn it into power. Whipping a fungo bat through the zone will focus on your fast twitch muscle fibers and will help increase bat speed. Amazon – has fungo bats from Louisville, Rawlings, Mizuno, etc. What is a heavy bat used for? A weighted bat (or you can use removable weights – see “batting weights” below) is a great hitting aid for getting stronger. It will focus on strengthening your hands and forearms which is important for increasing bat speed. After using a heavy bat, your normal game bat will feel lighter. It is also nice to have one of these for warming up your body before batting practice. What should I look for when buying a heavy or weighted bat for batting drills? Make sure the bat isn’t too heavy. You should still be able to swing it normally, just slower. 3-5 ounces heavier than the length is a good range. Also, it doesn’t really matter if your heavy bat is wood or metal. Batting weights can be used as a replacement for a heavy bat. You can use these hitting aids for your on deck preparation as well as using for batting drills. The nice thing about using bat weights is that you can customize how much weight you want to add to your bat. You may want to increase the weight if you have been working out and getting stronger. With the set of weights, you won’t have to go out and buy a new bat. 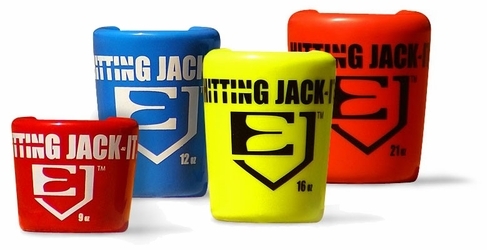 The hitting jack-it is a weight that fits near the label of the bat so you can still hit with the barrel. Alternative weights such as “doughnuts” sit right in the middle of the barrel making it difficult to use for drills. Pro tip: Also, keep in mind that the distribution of the weight matters. A 16 ounce Jack-It weight will feel lighter than a 16 ounce typical donut because the donut is further away from your hands. The further it is toward the end of the barrel, the heavier a weight will feel. If this weight looks familiar, it’s probably because you’ve seen it at just about every pro stadium. 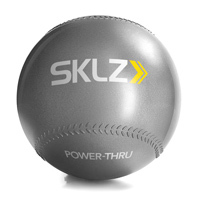 Pro players use it, but it also will fit any metal bat, wood or softball bat, so it’s great for younger players too. Note: I’ve looked at a lot of online stores. Most have weighted baseballs for pitching. The stores above were the ones I found with weighted baseballs meant for hitting drills. Some players really like a little extra protection for their hands. Just be warned that most people that use the direct protect or other thumb protection get so used to it that they can’t hit unless they have it on their thumb. This training aid is a rubber guard that fits over the thumb of your top hand when hitting. 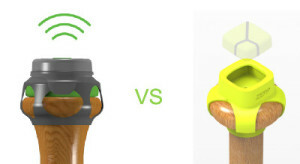 The rounded part faces into your palm and the flat part makes contact with the handle of the bat. The direct protect helps take the sting away on an extreme jam job or when you hit a ball off the end of the bat. There are three different sizes to ensure you get a proper fit. They also help keep the bat in your fingers which is the optimal bat placement in your hands. This prevents the bat from getting too deep into your palm. You can find this thumb protector here. The truth behind baseballs is “you get what you pay for”. I used to look for the best deals on baseballs and too many times after one swing of the bat, the ball would be dented or oval shaped. Clearly, that is not good for a baseball. Also, there are baseballs that feel like they are stuffed with rags, they don’t go very far and they sound dead. Some even have a glossy waxy coating, which makes for a cheap ball that will quickly fall apart. If you pay a little extra for baseballs they will last much longer. Keep in mind that the older and stronger the hitter, the better ball you will need to buy. If you are working with a 10 year old, he won’t be able to swing hard enough to dent certain balls, but use the same balls with a 16 year old and they may last 2 rounds of batting practice. In my experience Rawlings and Diamond make the best baseballs to use for batting practice. More places to shop for baseballs: Baseball Monkey | Baseball Express | Hitting World And as always, thanks for clicking our affiliate links. It’s free for you, and it helps us to keep the 100’s of pages of baseball instruction on this website free for everyone. When using a batting tee especially a portable tee (G tee or tanner tee), use a 5 or 10 pound barbell weight to slide over the shaft of the tee. This weight will help keep the tee in place and will keep it from falling over every swing. 10 lb. Barbell Weight- Once again, the company doesn’t matter, look for the best price. Make sure you find a barbell plate that has a center hold that is large enough to fit over a batting tee. This weight helps to keep the tee from falling over or moving around after a swing. This weight is too big for the G Tee, but will work fine with Tanner Tee. Baseball Hitting Drills for Batting Tee – Book + Videos. Did you get yours yet? Click to learn more.